PAWS was contacted by residents on Antipaxos and asked to visit the island with a view to neutering several cats and carrying out health checks. Two visits were arranged - the first in early October where Mary & Giampi (who live on Antipaxos for 7 months of the year) were the hosts. On this occasion our Greek vet Nefeli went across with one of the UK vets Heidi Cooper. They had a wonderful day and neutered 10 cats. A month later Nefeli returned with Anna having been asked by Akis & Ioanna if they could neuter the cats near their taverna and cottage. Seventeen were neutered on this 2nd visit! Below are excerpts from Nefeli's reports of both visits. More photos can be found in the Antipaxos album in the Photo gallery. On the 3rd of October 2017, I had the opportunity to take part in a cat neutering project which took place in Antipaxos (a small island south of Paxos). My colleague Heidi and I met our hosts Mary & Giampi in Gaios port where they took us and our equipment by boat to Antipaxos. We arrived at the small harbour of Agrapidia on Antipaxos around 11am and were then transported to the home of Mary & Giampi. As soon we arrived, we began catching cats using the PAWS traps. Our hosts had prepared an area in their courtyard with amazing sea views across the mainland where we could work. At the end of our day’s work, having neutered ten cats, we were treated to a delicious meal which we ate outside in glorious sunshine. After the meal, Giampi took us back to Paxos in his boat and we felt not only had we improved animal welfare on Anti Paxos, we had made wonderful new friends. We had been asked by Akis and Ioanna (a Paxiot couple who run a taverna on Antipaxos during the summer) whether it would be possible to visit the island for a day, to neuter the cats that depend on them for their food (summer and winter). Winter is a difficult time for the cats on Antipaxos to find food as the island is almost uninhabited. Thankfully the day that we had arranged to go was sunny, warm and most important with calm seas. During our crossing in Aki’s speed boat, the conversation revealed that there were ‘twenty plus' cats at the couple’s cottage! We just hoped that we’d packed enough equipment. On arrival, it was an easy journey from the tiny harbor to the couple’s property with cages, traps and supplies loaded onto Aki’s trailer attached to his jeep. Soon after our arrival at the cottage, a few curious neighbors arrived and were intrigued as to how were going to set up surgery and catch wary cats. These spectators drunk coffee with us, chatted about PAWS work and then went merrily on their way! 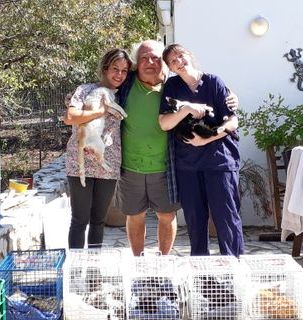 Akis and Ioanna were very helpful with trapping some of the very wily cats and also were good at preventing kittens too young from being caught. After rather a chaotic start, we soon got organized and the final count at the end of the day was SEVENTEEN cats neutered. Then a very welcome glass of local Antipaxos wine was offered and some bottles given to us to take home. We packed up the equipment and after a very busy day were ready for the return journey by around 5pm. Akis and Ioanna were very relieved at the thought that there would be fewer kitten fatalities and hungry cats during the winter months on Antipaxos. We have arranged to go back to Antipaxos again during the winter to neuter the young kittens that will be mature by then and to check on the other cats.